It’s no secret. It’s finally here! 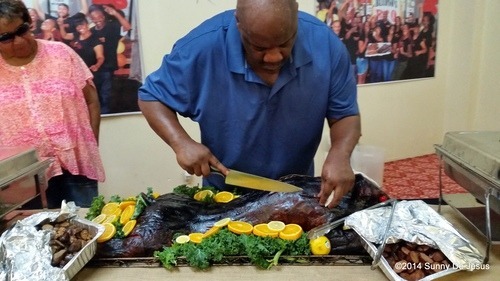 Kevin Bludso, the Grill Master at Bludso’s BBQ in Compton, California, made all of our dreams come true over the weeked with the debut of the Whole Smoked Pig. It’s about time we got it. 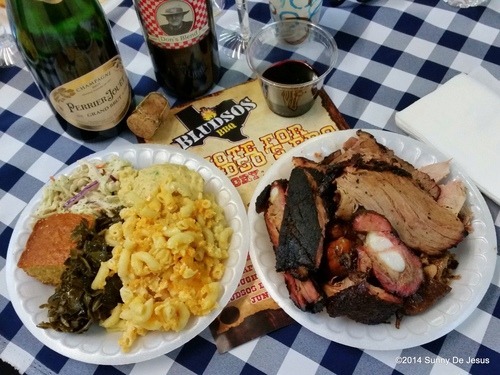 Every year, I trek to Bludo’s BBQ for my friend’s annual special dining event. With the freeway construction on the Westside derailing my shortcut, I had to painstakingly drive through five freeways to get to Bludso’s BBQ for the party. When I arrived, I noticed lots of changes. Besides the opening of Bludso’s Bar and Que in the Fairfax District (a predominantly Jewish community) in Los Angeles and the food show appearances, what’s new is remodel of the original location in Compton. The entire take-out counter window has expanded. There still isn’t any tables and chairs to sit down and eat your meal, but that will soon change when the former church space next door is converted to the dining and banquet room. What I’m also excited for is the super-large smoker perched in the back with all the other smokers that are like the size of my car. You see, this new smoker is solely used smoking a few whole pigs Texas-style, which is slow and low for some 15 plus hours depending on the size. 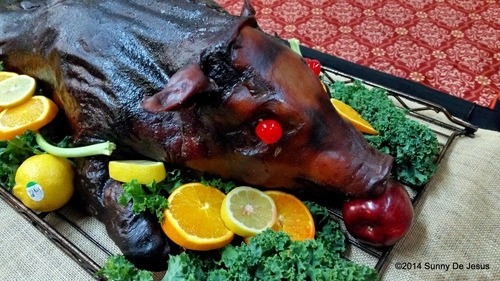 Of all the meat choices at our party at Bludso’s, I dove into that whole smoked pig. I ate slices of pork belly, pulled off some pork shoulder, and I even took one of the jowls. So you’re probably wondering what the verdict is? Well, not only can Kevin Bludso smoke a mean brisket, he can also smoke a whole pig! OMG, it’s a MASTERPIECE! Every single cut of meat is divinely smoked, juicy, tender, and succulent. Eating with a fork and wearing a napkin on you shirt collar do not do justice when, instead, the pork juices dribbles all over your fingers and onto the palms of your hands. 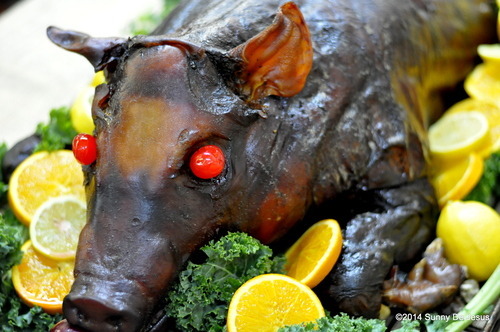 At the moment, the Whole Smoked Pig is only available for catering and only at the Compton location. The regular menu of Brisket, Chicken, Pork and Beef Ribs, and Rib Tips are still available for purchase until they run out for the day. The menu has Meat Combo platters for $14 or you can order a la carte per pound. Big Eaters will like the $30 Texas Platter, which gives you just a little bit of everything. But if you have a few extra dollars in your pocket and want to feed the entire family, I suggest ordering the $99 Large Party Tray. 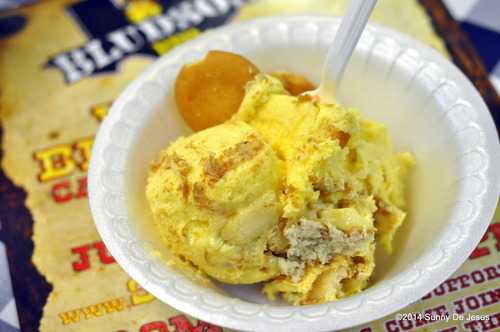 Whatever you do, please don’t miss out on the BEST homemade Banana Pudding and Red Velvet Cake desserts at Bludso’s BBQ. No meal is complete without their dessert. Previous Strawberry Season is Back! Stawberry Clafoutis is back too.